historical spending. Compare your spending year-to-year, month-to-month, whatever fits your style. expenses and recurring monthly expenses. Manage your money in one place. Penny Watchers calculates your average spending in any category to help you easily create a budget based on historical spending. Compare your spending year-to-year, month-to-month, whatever fits your style. We'll help you plan ahead by showing you how much you'll save by cutting back in any category. You can even plan for one-time only expenses and recurring monthly expenses. Know what's going on in real time. Penny Watchers shows you exactly how your spending decisions will affect how much you have left at the end of the month or year. You'll know immediately what you can do today to save more tomorrow. 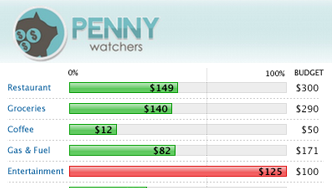 PennyWatchers allows you to organize your accounts in one place. 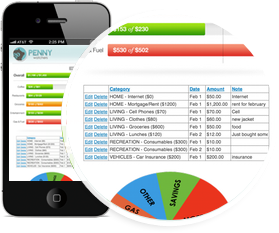 With PennyWatchers you can set a budget, track your goals and do more with your money, for free!